No, it is not a misprint. A Lodge Charity Steward has actually given some money to a Freemason! This situation is so unusual that a photograph was taken to affirm the event – and what can’t speak, can’t lie! As has been said to every candidate, “Charity has the approbation of heaven and earth, and like its sister, Mercy, blesses him who gives as well as him who receives.” It is a tribute to that sentence that is at the background to this tale. The recipient of the cheque for £100 is WBro Neville Rayner. Neville has been a “friend” of the ELMC for many years by making regular donations to the local Masonic Charity. Every so often, the ELMC has a draw from among its donors, and Neville won the most recent draw held at the ELMC Annual General Meeting. His own Lodge meets on alternate months and it had met just before the draw. 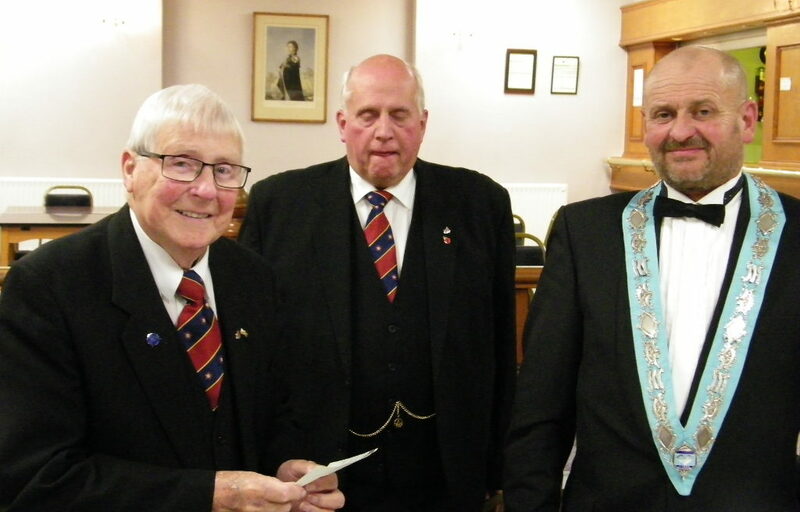 It seemed wrong to delay passing on the cheque, and as he is a regular attendee at Pilkington Lodge, that was the perfect opportunity for Pilkington Lodge Charity Steward John Cross to present the cheque under the watchful eye of Worship Master Chris Turner Smith. The opportunity to win in a future ELMC draw is available to anyone who contributes £5 per month to our charity – although everyone will agree that the real benefit of making that donation is the knowledge of the good that the ELMC does for Freemasons and their families who have fallen on hard times, and the benefit that good causes throughout the Province receive as a consequence of grants from the ELMC. For details of how to donate and become a “Friend’, go to www.elmc.co.uk/donate/or speak to your Lodge or Chapter Charity Steward.